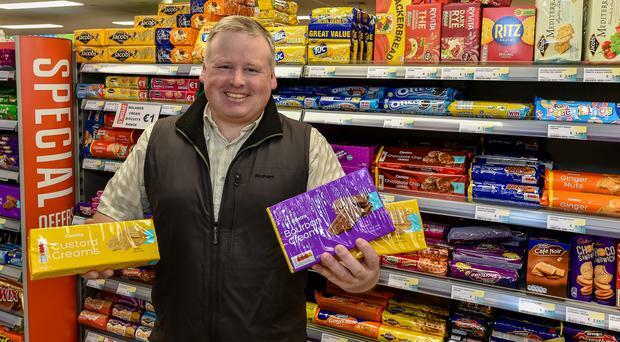 Edward Coyle owns and runs Centra in Raphoe, Co Donegal, six miles from the border with Northern Ireland. He has been stockpiling UK-made items, such as Jacob’s Custard Creams, Heinz Beans and garlic bread, for months in anticipation of a no-deal Brexit. Now, however, with the deadline pushed back to October, his goods will go out of date unless he sells them, which will in turn impact his supply chain. “We were ready for March 29 and we were ready on April 12. Now this delay has wrecked our plans,” Mr Coyle said. “We have to sell off all the stuff that we had stockpiled and we have to stockpile again for October, but my worry is that Brexit can happen at any time. “It can happen in June when they review it, so how do I prepare? How do I manage that? Mr Coyle said he and other businesses in the Republic were taking no chances when it came to products manufactured in the UK and had filled warehouses with essentials to avoid empty shelves. “The items I have stockpiled are items that we can’t guarantee we will have on the shelves if a no-deal Brexit happens,” Mr Coyle explained. “Anything that is produced in Great Britain is stuff we have stockpiled. “That would be biscuits such as custard creams, which are manufactured in the Great Britain and brought across, and brands like Heinz. “Custard creams are very telling because they are something that only sell very well in the British Isles — Ireland, England, Scotland and Wales. They are only made in Manchester and a few factories in Great Britain. It’s not something where you can ring up France and ask them to send you a few containers of custard creams — they don’t make them anywhere else. “You either have them in from your Great Britain factory, or you don’t have them at all. “I would have several pallets of custard creams and Bourbon creams stockpiled already. That would be almost 4,000 biscuits. “They all have a sell-by date, which is before October, and now I have to stop buying them from my supplier and sell what I have stockpiled. “That all has implications for the supply chain behind me. “Another thing we have been stockpiling is garlic bread. There is one factory in the North that makes all the garlic bread for the entire island of Ireland. “If there is a hard border and the customs go in and there are controls and lockdown on the border, all of a sudden the 26 counties are going to have difficulty sourcing fresh garlic bread. They will have to get it from France or find some other way. “Because the garlic bread is fresh, the day we can’t get it is the day we can’t get it. “We have had to compensate by stockpiling frozen garlic bread. We would have several hundred frozen garlic breads stored in our warehouse in Galway. Mr Coyle hopes the UK will not leave the EU at all, but he feels that the current situation has left everyone “in limbo”. “I can see a lot of wrong things in Europe, but I certainly don’t want to leave it,” he said. “If there is anything that needs fixed, we will fix it from the inside. “With what has happened now, we are all completely in limbo. “You have all these guys getting paid thousands of pounds a week to sort it out, running around in suits trying to sort it out — and they need to sort it out.